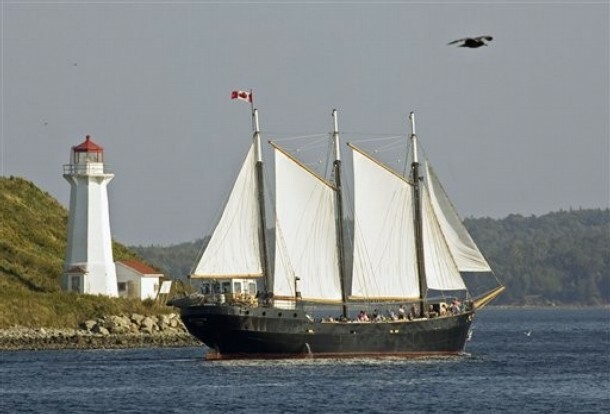 On the evening of Thursday, June 21st, we will gather at the Halifax harbourfront boardwalk at 8:00 because we sail at 8:30 for a two-hour tour of the Halifax harbour on the tall ship Silva. Come enjoy Halifax beautiful harbour, some hors-d'oeuvres and Nova Scotian CEILIDH (pronounced “kay-lee,” Gaelic for “kitchen party”). With a bit of luck we'll enjoy a fabulous,sunset or even catch sight of a whale in the harbour, though sightings are admittedly rare. The Silva itself is an extraordinarily stable, steel hulled ship, and nicely refurbished for such events. Please join us for a memorable evening. One of Tall Ship Silva's finest features is her wide open deck that accommodates all of her 150 guests in one area with a 360 degree view of Halifax Harbour. Traditional varnished wood seating is placed around the entire deck so guests can sit back, relax and enjoy the sights. The inside dining room is decorated simply yet elegantly with colourful Nova Scotia folk art, classic white linens, cushioned bistro chairs and nautical centre pieces. It features two large skylights that allow you to view the sails & stars in the moonlight. A highlight and guest favourite is the "Wheelhouse Pub", with a wide selection of beer, wine, and cocktails and boasting a fine selection of single malt scotches. There is plenty of seating with bar stools, cocktail tables and a comfy cushioned settee surrounding the room. Tall Ship Silva was built in Karlstad, Sweden as a 130' three masted steel schooner. During the first two decades of her life, she was used in the Scandinavian fishing industry, with regular trips to Iceland. In the 1960's Silva was refitted as a bulk freighter, having her sailing rig removed. Silva continued coastal trading until 1994 and remained in Sweden until the summer of 2001 when Canadian Sailing Expeditions bought her and delivered her for the first time, to North America. The banquet for the 2012 HOPOS Conference will be held at the Waegwoltic Club ("waegwoltic" is a Mi'kmaq name meaning "end of water"). The club is located on the beautiful Northwest Arm, a five-minute walk from the conference venue. Join us for this great 3-course dinner (menu). Darren Abramson, Sina Adl, Micah Anshan, Adriana Benzaquén, Samantha Copeland, Ford Doolittle,Andrew Fenton, Mélanie Frappier, Lisa Gannett, Letitia Meynell, Gordon McOuat, Kathryn Morris, Lisa Mullins, Andrew Reynolds, Eve Roberts, Ian Stewart.